Korean operator KT finally launched its first 4G telecom service today as it went live with an LTE service which had been delayed for a month. According to Korea Herald, the operator is aiming to secure 4 million customers for the new service by the end of the year. The company’s LTE launch has been delayed for more than a month. Despite our late start, we will introduce a more complete LTE service. KT’s projections estimate that the LTE service will cover 84 cities, brining it level with rival operator SK, by April, making use of a Warp, new cloud-style management style, to provider a stable and fast service to users. The company was boosted by a court ruling last week that allowed the company to drop its 2G services so it could utilise its 1.8GHz band for 4G LTE services. Despite KT’s late offering of 4G services, its launch will ensure that by April, 92% of the South Korean citizens will be offered a form of LTE (4G) services. However, with South Korea leading the way as the world’s most data-hungry country, KT has ruled out unlimited-data plans for its LTE services, given that South Koreans consume three times as much mobile data than second-placed country, France. 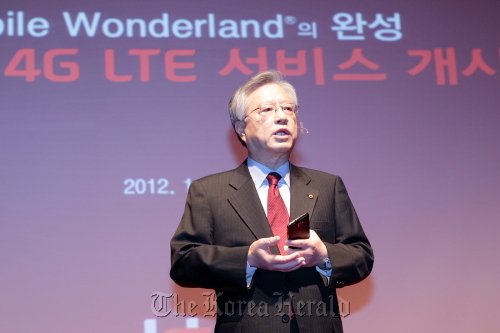 Before rolling out its new 4G network, KT joined its rivals in offering Apple’s latest smartphone, the iPhone 4S. With preorders reported to have hit 300,000 units between the companies, demand for the Apple handset was said to have dropped shortly after launch as South Korean consumers looked to faster 4G LTE-enabled smartphones.